"Korea's noblest hopes and bitterest defeats seem so close. The ability to transport the reader through space and time with printed words; that's the debt the reader owes to the skilled chroniclers in this book...."
"...an inside look at the evolution of the peninsula from its fin de siècle days as the isolationist 'Hermit Kingdom,' to the outbreak of the Korean War (often unfortunately called the "Forgotten War") and its eventual plunge into the industrial and digital age....it is good to know there are those out there whose job it is to bear witness and to ensure there will never again be another forgotten war...."
"The correspondents who contributed to 'Korea Witness,' and those whose dispatches are included, constitute a Who's Who of the 20th century's most famous Asian foreign correspondents.... Students of both Asian studies and journalism will be enthralled by the excellent storytelling contained within 'Korean Witness.'" "The strength of this book is undoubtedly the way it brings history to life....a great book to dip into, or read from cover to cover, to be presented with a vivid picture of Korean modern history from people who witnessed it happening." In KOREA WITNESS, foreign correspondents remember the land of the morning calm -- and their work. The first American newspaper article about Korea more than a century ago reported the exhibition of a "mermaid" caught off the coast of "Corea." When sailors found it, the account said, the creature was holding a mirror in one hand and a fine-tooth comb in the other, letting out "wild but not unfamiliar cries." Since that time of myth and wild imagination, parades of foreign correspondents have passed through Korea, trying to understand a country known as the "land of the morning calm" but also inhabited by rambunctious people with a tragic and often violent history. It was a daunting task a century ago, as it is today. For example, Jack London, the famed author of such American classics as "The Call of the Wild" and "White Fang," struggled with a horse with the "most beautiful eyes" that turned out to be "stone blind." But still it was foreign correspondents who first reported the Koreans' legendary "March 1" anti-Japanese uprising in 1919 to the outside word. They labored in sweltering heat and icy cold of the Korean War and gave the world the searing accounts of refugees killed by friendly fire, helpless people massacred by warring armies and soldiers crying over their fallen comrades. While the domestic media remained gagged by the military regime, foreign correspondents entered the rebellious city of Kwangju in 1980 and reported the bloodshed perpetrated by army troops there, providing the world with some of the best-known iconic images of the South Korean people's twisted journey toward democracy. Who were these foreign correspondents? What did they think of their work and the country and its people they were assigned to cover? How has South Korea changed and evolved in the eyes of foreign corespondents over the decades? In 455 pages, KOREA WITNESS: 135 YEARS OF WAR, CRISIS AND NEWS IN THE LAND OF THE MORNING CALM -- provides episodic answers to these questions. The Seoul Foreign Correspondents Club arranged for publication of the book, which brings together contributions by 60 correspondents, retired and practicing, on coverage of Korea by foreign media. The publisher, EunHaeng NaMu, printed the book for release at the 50th anniversary of the SFCC on June 2, 2006. The book, the first of its kind, arranges the contributions in a roughly chronological order. It was in 1871 that the first foreign journalist ever to report from Korea arrived with American forces for what some accounts at that time called "the Corean War" -- the battles between American and Korean forces on Kangwha Island. The journalist was a photographer named Felice Beato, nationality unknown, who came over from Japan. His photographs are featured in the book's opening chapter on the early history of Korea as reported in foreign publications. 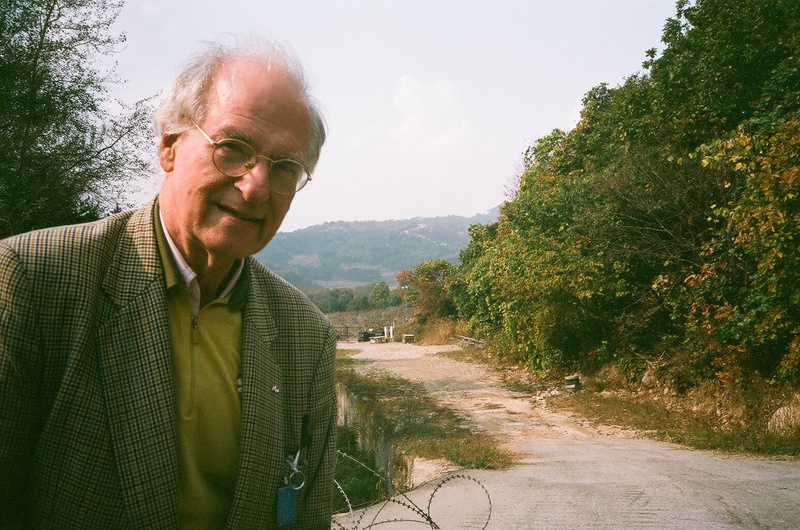 KOREA WITNESS also includes gripping accounts of correspondents covering the Korean War, including Marguerite Higgins of the New York Herald Tribune, Louis Heren of The Times of London, Bill Shinn of the Associated Press and Frank Gibney of Time, all of whom have passed away. John Rich of NBC, living in retirement in Maine, dictated notes on his Korean War experiences, and author Robert Elegant, with the International News Service during the war, later a best-selling novelist, also dictated notes as well as an excerpt from his new novel, "Cry Peace." KOREA WITNESS also features fresh revelations of the trials and tribulations of correspondents during the rule of Park Chung Hee, eye-witness descriptions from covering the Kwangju revolt and analysis of efforts at reporting from North Korea. Contributors include retired authors and journalists recalling critical periods -- Don Oberdorfer of The Washington Post, Richard Halloran of The New York Times, Sam Jameson of the Los Angeles Times, Bradley Martin of the Baltimore Sun, Norm Thorpe and Joe Manguno of the Asian Wall Street Journal, Mike Tharpe of U.S. News & World Report and the Wall Street Journal, Norm Pearlstine of the Wall Street Journal and Forbes. Korean contributors working for foreign news agencies include K.C. Hwang and Paul Shin, formerly of the Associated Press, Shim Jae Hoon, retired from the Far Eastern Economic Review, and Kim Myong Sik, formerly Reuters, now with the Korea Herald. Chi Jong Nam, formerly of the Los Angeles Times, Lee Su Wan of Reuters, B.J. Lee of Newsweek, and Sohn Jie-Ae of CNN also contributed. The editors, Donald Kirk, formerly International Herald Tribune and Chicago Tribune, and Choe Sang Hun, International Herald Tribune, also wrote for the book -- Choe on the story behind his Pulitzer prize-winning coverage while he was with the Associated Press of the No Gun Ri massacre during the Korean War. 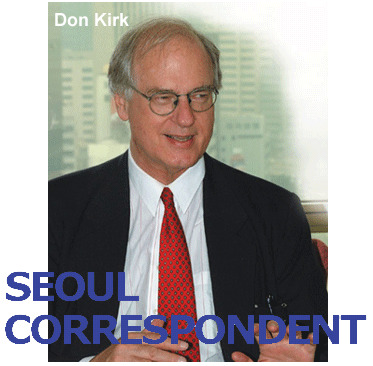 Kirk, a long-time correspondent who first landed in Korea in 1972, reminisced on his years reporting from Korea, including his expose in the IHT in 2001 of huge funds paid by the South Korean government to expedite the June 2000 inter-Korean summit in Pyongyang. The book is dedicated to the 23 foreign journalists killed during the Korean War. Among these are five Chinese journalists, all with Xinhua, the New China News Agency, whose names are listed for the first time among members of the media who died in the war. II.--Charles Duerden interviews Donald Kirk for Korea Trade & Investment, journal of the Korea Trade-Investment Promotion Agency, KOTRA, Vol. 21, No. 5, September-October 2003. Duerden: Is Korea an exciting place to cover? Kirk: There’s always something going on. It’s somewhat repetitious but it’s the same for London, New York or even Baghdad. I’m into several stories here, all of them ongoing: there’s the economic story, the North Korea story and there’s the cultural story, which I don’t really have time to cover. There are quite a few strands here and they are always percolating, if you’ll excuse me mixing my metaphors! Q: What are the most significant stories you have covered? A: I’d say the assassination of President Park Chung-Hee in October 1979 and the turmoil that followed, and the Gwangju revolt of May 1980. I visited the city several times to cover the story in what was a most exciting period. The economic crisis of 1997/98 was a totally different type of story but very significant nonetheless. The Gwangju revolt was also a human rights story and along with the economic events of 1997/98 was a story of the transfer of government, since the election of Kim Dae-Jung marked the first time that an opposition leader had come to power. Q: You must have seen your fair share of scandals and crises during your time here. Is the present situation any different? A: Not really, except for the issue of the payoff to North Korea over the 2000 Pyongyang summit. It’s interesting because one doesn’t know where it’s heading, if it has come to an end or if there will be further revelations. There have always been corruption scandals here. The big difference between here and the Philippines, say, is that in Korea the perpetrators get arrested. The scandals also reveal ongoing corruption and come tinged with a desire for revenge. It’s hard to know what to make of it. Or why corruption is endemic when the penalties are so high. Q: Despite its setbacks, Korea has become a major economy and trading power in the time you have been covering events here. What do you think makes Korea so resilient? A: I think it’s been a great combination of drive and decades of frustration under Japanese rule and before that, the Li Dynasty, which was a closed, rigid system that discouraged creativity. Under the Japanese, things were even worse. All this has generated a desire to catch up with, and surpass the rest of the world. During this time, Korea has had the security of alliance with the United States, of course, and I think that has been important. Q: What do you think is behind the current wave of union militancy and where do you think it will end? I put the current upsurge in activity down to workers’ frustrations about being left behind since the economy has not been expanding as much as it has in previous years. Also, talk of privatization among the railways and banks has stoked fears of job losses. I certainly try to cover labor issues and understand the labor point of view. For the Hyundai book I interviewed labor leaders, some of whom were in jail and covered the big demonstrations of the time. Q: While North Korea is in a nuclear standoff with the United States, North/South cooperation is at an unprecedented height. How do you explain this dichotomy? A: South Koreans really want to improve relations with the North and are not enthusiastic about the United States raising tensions. South Korea doesn’t want to appear uncooperative with Washington, but does not share President Bush’s enthusiasm for being tough with the North. North Korea, for its part, wants to improve relations since it needs economic cooperation with the South. The big question is how will the [Hyundai/North Korean] Gaeseong Industrial Complex project fare? One great thing about Korea is its unpredictability. No one predicted war [in 1950], the Economic Miracle, the rise of Kim Dae-Jung, or the nuclear crisis. No one can be sure that North/South relations will continue to improve. There are always impediments on the road to rapprochement. There could even be changes in North Korea of a surprising sort. Q: From a personal point of view, what do you enjoy most about living in Korea? A: Well, every story you do is a challenge, and I find the people stimulating, sometimes very nice, other times abrasive. I think all foreigners who live in Korea enjoy the mixture. I have a number of Korean friends, and that’s another reason for being here. Korea tends to slip off the international news agenda unless something especially remarkable is happening - a presidential assassination or some sort of massacre. Korea Witness aims to redress the balance, providing the background to major events in the so-called Land of the Morning Calm from the men and women who reported them. As Philip Graham remarked, journalism is the first rough draft of history. Witness was put together to commemorate the 50th anniversary of the Seoul Foreign Correspondents' Club, with the manual typewriter, freight-the-film-to-Tokyo generation and their younger satellite-savvy confreres being asked to 'dredge up' their Korean experiences. Although their contributions overlap at times, the book illuminates the most significant occurrences on the peninsula from the days of the Hermit Kingdom right up to the furore surrounding stem-cell researcher Hwang Woo-suk. Purists might point to the omission of any mention of the shipwrecked Hendrick Hemel, whose account of 17th-century 'Corea' was a best-seller in its day. Whether James Fenton and P.J. O'Rourke declined to take part or weren't approached is unclear, but their reminiscences (especially Fenton's, as tellingly documented in All the Wrong Places) would have made Witness stronger. One of Korea's earliest mentions in the foreign press was headlined 'Our Little War with the Heathen' by the New York Herald in 1871. A recurring theme in Witness is foreign attitudes to Korea, with both outsiders and natives at mulish cross-purposes over the other's intransigence. Koreans deplore foreign arrogance, foreigners castigate what they perceive as a self-serving bureaucracy, hidebound by red tape and what was once a thriving 'envelope' culture. Caught in the middle are the Korean nationals working for international media, intent on hitting deadlines while being deluged by officialdom with appeals to their patriotism that stop just short of threats. 'Because I don't know what is good for Korea's interests, I try my best to tell the truth,' writes Newsweek's Lee Byung-jong, dexterously treading a fine line and doubtless speaking for many local hires. Inevitably, it's the tales of mayhem that hog the limelight, together with reporters' trenchant footnotes. In August 1974, Richard Halloran was half listening to an address by South Korean president Park Chung-hee while idly speculating what would happen if somebody took a shot him. Moments later, a would-be assassin opened up with a snub-nosed pistol. Norman Thorpe notes with some rancour that when Kwangju, described as South Korea's Tiananmen, revolted bloodily in May 1980, it was pushed off the front pages in the US by the eruption of Mount St Helens. CNN's Sohn Jie-ae responded so quickly to a tip about the collapse of the Sampoong Department Store in Seoul in 1995 that her own car, with siren blaring, headed a column of emergency vehicles making for the scene. Choe Sang-hun's Pulitzer-winning story on the massacre at No Gun Ri only saw the light of day after months of stalling by the editors at Associated Press in the US, giving the author time to reflect on media double standards. Although less a fully fledged documentary than a slightly random slide show, Korea Witness does shed light on the republic's pivotal role in the 20th century, both in Asian and world affairs. As a single example, Norman Pearlstine of the Wall Street Journal recalls the genesis of the South Korean shipbuilding industry in the 1970s, with recently recruited farm labourers welding a gigantic oil tanker guided by a couple of British consultants. Witness also includes fair coverage of North Korea, with reporters acknowledging the dearth of absolute hard news and the perilous path trodden by some media who pay for stories and video footage, both often of questionable veracity. 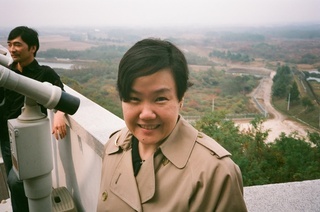 Journalist Jennifer Chang at the observatory, Chorwon district, on the southwest corner of the Iron Triangle overlooking the barbed-wire fence on the edge of the demilitarized zone between the two Koreas. That's Bloody Ridge, scene of Korean War carnage, on the far right. Fisherman displays wheelbarrow full of oysters drenched in oil that drifted in from where a crane crashed into a supertanker in Yellow Sea five miles off-shore. Volunteers on clean-up at Chollipo Beach -- forester Shin Kyong Chol on right. Images of Presidents Bush and Kim Dae Jung with crowd at dedication of Dorasan Station, February 20, 2002. Sign at right points to Pyongyang to North, Seoul to South. With South Korean soldiers at gate on road to Demilitarized Zone, looking south. In background is Peace Dam, Hwacheon district, on North Han River six miles below DMZ. Richard Halloran of New York Times scrawled a question for Sam Jameson of Los Angeles Times after catching this image of Jameson, r., Don Oberdorfer of Washington Post, l., and Kirk, then with Chicago Tribune, in Seoul, 1974.